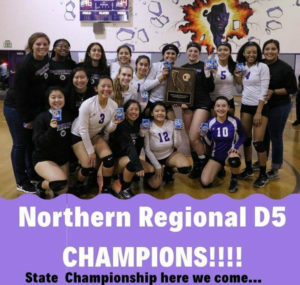 In a spectacular show of athleticism and grit, the Washington Union High School girls volleyball team came from behind to secure the Northern Regional D-5 Championship title against Ripon High School. Played in front of a supportive home crowd, the girls lost the first two sets before rallying from behind to win the third set. The team continued to play hard to secure a 4th and 5th win and a chance to compete for the State Championship, this Friday night. The State match will be played at 4:00 p.m., on Friday 11-16-18 against El Camino High School. The game will be held at Santiago Canyon College in Orange, CA.